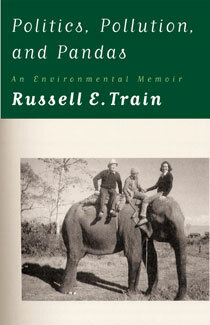 Russell E. Train, was chairman emeritus of the World Wildlife Fund, has led a remarkable life in conservation and environmental politics. Though many of his contributions have been unsung, Train was the catalyst for many of the nation's most important positive environmental policies that remain with us today. In the current political climate, where party divisions are so sharp and environmental concerns are so often shunted aside, Train's journey as a life-long Republican and an ardent conservationist is an inspiring story. Much of the important environmental policy Train helped to devise and implement occurred during two Republican administrations, those of Richard Nixon and Gerald Ford. Train served as undersecretary of Interior early in Nixon's administration before becoming chair of the president's Council on Environmental Quality (1970-1973). He then moved on to many accomplishments as head of the Environmental Protection Agency (EPA) from 1973 until 1978. At the end of the Ford administration, Train left government to become president of World Wildlife Fund (WWF) in the U.S. where he played a key role in developing that institution into the major conservation organization it is today. Politics, Pollution, and Pandas is a fascinating, behind-the-scenes account of the politics of the environment over much of the last half century, as told by one of its master architects. "This is an adventure story—not among the wild animals he knows so well but among the politicians as he pioneered the efforts to conserve our wildlife, our natural resources, and the very atmosphere that supports us all. It is a history invaluable to those interested in the preservation of our environment; a matter in which we all should be concerned and involved." "Train has produced a thoughtful and insightful account of a remarkable public career, an account which reflects very fairly the effort during my presidency to strike a balance among the nation's economic, energy, and environmental needs."